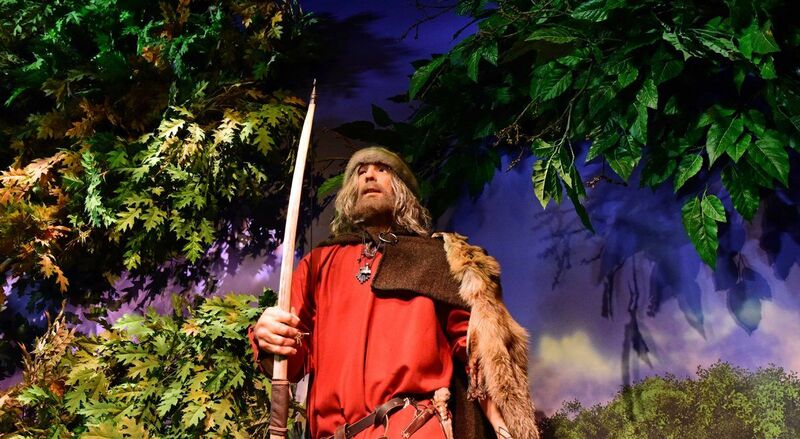 Who Will You Discover at JORVIK? You will encounter The Hunter as you enter the city of Jorvik for the first time. 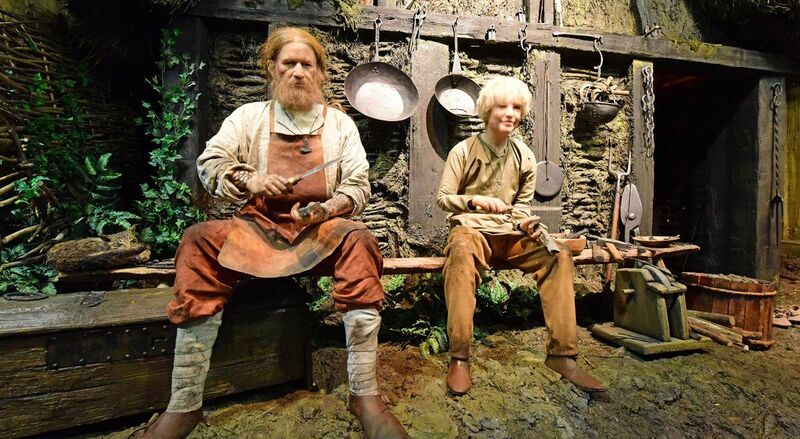 He is originally from Norway and so bids you welcome to Jorvik in Old Norse. He is dressed in typical Viking fashion with a woollen tunic over a linen shirt, embellished with tablet weave. His teeth are filed and he has tattoos. He carries a bow, which is a traditional English ‘D’ bow and what he has caught for his supper, a hare. With him is his dog, which is about the size of a modern Alsatian. Our hunter is restraining him with a chain and collar which is based on a find from a 10th century boat grave from Uppsala, Sweden. Dog skeletons are not uncommon in pagan Anglo-Saxon graves and these must reflect a beloved pet accompanying his master or mistress to the next world. Similarly, Viking graves often contain one or more dogs. The Tjängvide image stone clearly shows the arrival of a dead warrior into Valhalla. He is met by a Valkyrie, bearing a mead-horn, but behind her waits the warrior’s faithful hound. Like many modern English-folk, heaven would not be complete without dogs. Silks and a cowrie shell found in York reveal trade links with Central Asia and the Red Sea. 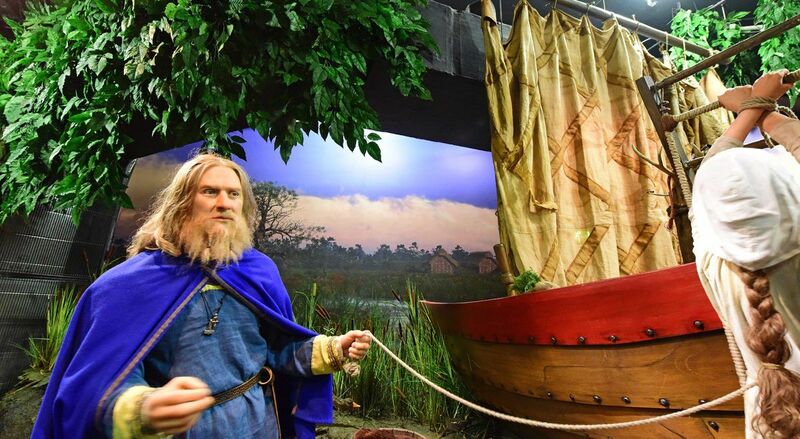 Arab scholars such as Ibn-Fadlan recount 10th century Norse trading expeditions to Baghdad, a major centre of the Islamic world. We have therefore represented this contact and trade by including an Arabic Trader who we suggest could have journeyed to Jorvik from the Near or Middle East. He carries with him a supply of silks that he is hoping to sell in Jorvik. Archaeological artefacts from Coppergate include a silk cap and a small silk reliquary pouch. When the Vikings came to raid the coasts of Ireland, people, along with ecclesiastical metalwork and cattle, were portable goods that could be taken off in ships. The Annals of Ulster record that in AD 821 Howth, Co. Dublin, was raided and ‘a great booty of women was carried away’. 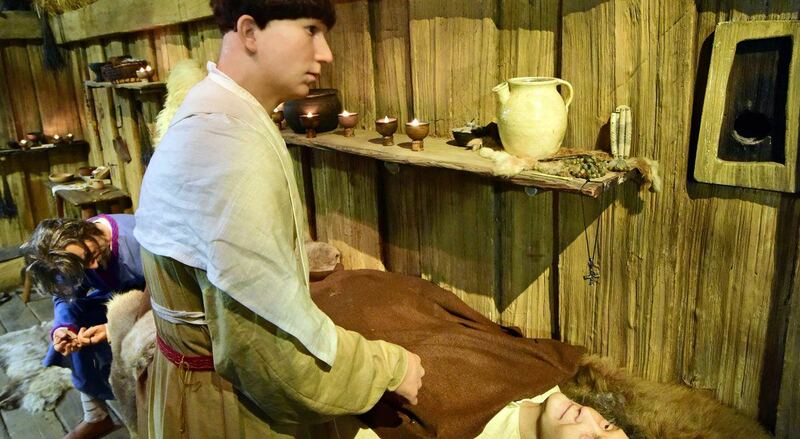 The Life of Findan, written in the late 9th century, suggests that some slaves were sold on to Viking colonies in Britain, while recent DNA studies suggest that many went to Iceland. Our slave trader, who is originally from Norway is shouting at the slave from Dublin in Old Norse, to get down from the trading ship that has just docked at the wharf on the River Foss. The slave trader is a rich man with expensive looking clothing and jewellery, in contrast to the slave who is dressed very simply. Our blacksmith is sitting on a bench outside his home teaching his young ten year-old son how to sharpen the knife he has just made. Both members of the family speak in Old English showing that they have lived in Jorvik all their lives. Around 220 knives were found at Coppergate alongside a number of hone stones, as well as everything from needles and nails to intricately crafted padlocks. Inside his house you can see his wife making supper over the hearth. The smith was an important member of Viking society. All other crafts and industries relied on the smiths to provide weapons, tools and fixtures and fittings. The detailed research carried out on the iron artefacts from Coppergate demonstrate the wide range of artefacts manufactured by the smiths who lived and worked there. 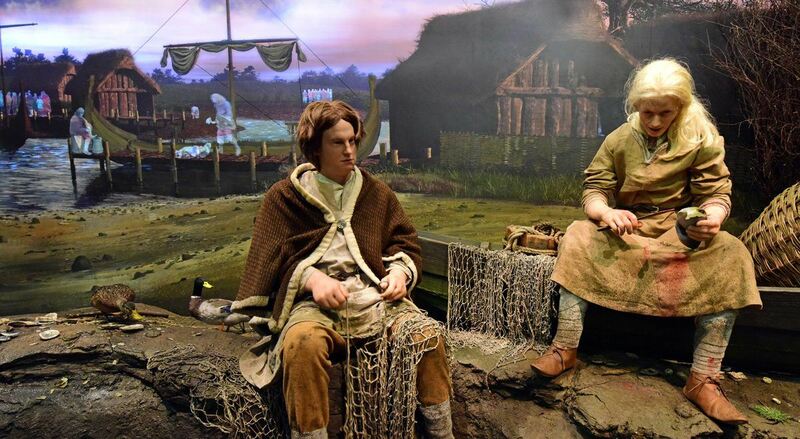 Our two fishermen are sitting on the wharf discussing their day in Old English, which suggests that they have lived in Jorvik all their lives. One of the men is lamenting that fact that his catch was poor today as his net broke and now has to be mended. 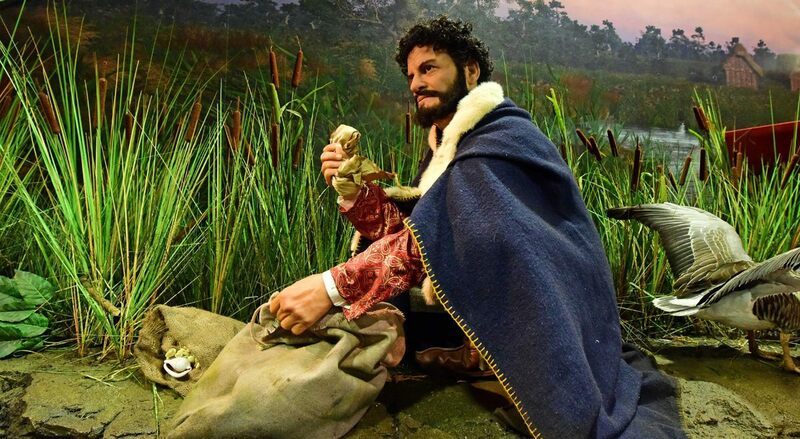 The other, whose facial features are based on a reconstruction taken from an actual Viking-age skull, is sympathising with him, whilst gutting fish. Fish bones found at Coppergate show how Jorvik’s population was influencing the fish stocks in its rivers. Samples from the mid 9th to early 10th century contain remains of eels, pike, perch, salmon, trout, smelt and carp. Two-thirds of the samples analysed from the end of the Viking period in York are herring. Few other marine fish made it to the city; instead, the local rivers, which became more polluted, were fished with increasing intensity. Within one of the reconstructed timber houses a lady is humming whilst working at her loom. She is dressed in a linen hangerok and under dress, with a cap covering her hair. 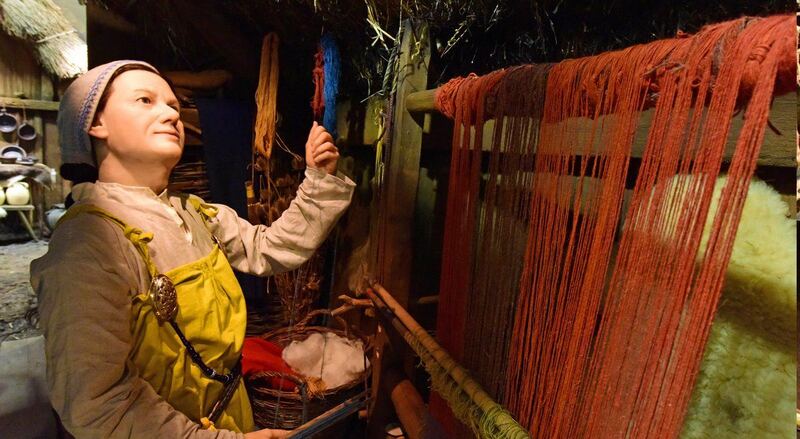 Spinning, weaving and dyeing took place in homes across Coppergate. Shears, wool combs and spindle whorls using for spinning out woollen thread, were found scattered across the building plots. Wool was probably cleaned inside the houses as many sheep lice were found in the excavations. Early looms were warp-weighted using fired-clay loom weights. Later these were replaced by two-beam vertical looms that were introduced from abroad. The people of York dyed their own textiles using plants such as madder, dyers greenweed and woad to produce reds, greens, blues and yellows. White linen woven from flax [vegetable fibres] may have been used for undergarments and finished using the glass linen-smoothers found here. Our leatherworker, Mord, is attempting to sew together the pieces of a shoe whilst sat at his stall on Coppergate, where he is selling his wares of shoes and scabbards. He is struggling as he suffers from Viking’s disease or Dupuytren’s Contracture. You can see it’s caused the fingers on his hand to become clawed. It’s a genetic disorder that runs in families, and seen particularly in middle-aged men. Tradition has it that it originated with the Vikings who spread it throughout Northern Europe and beyond as they travelled and intermarried. 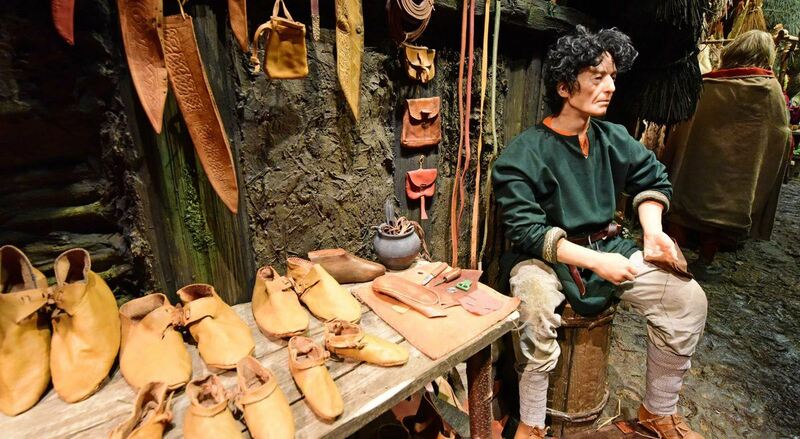 Leatherworkers in Jorvik made shoes of different styles including simple ‘slip-ons’ as well as boots and shoes that were laced or fastened with a leather strap or toggle. A very unusual and almost complete left shoe, found at Coppergate, was made from a single piece of leather. It was cut with a central sole section, the sides folding up around the foot and then sewn together with a seam running from the toes to the opening for the foot. No other shoe of this type has been found in Britain; it may then have arrived in York on the foot of a foreign trader or a slave. At the end of Coppergate you can see an older inhabitant of Jorvik trying to cross the road whilst struggling to walk with a crutch. She is around 46 years old and is based on the analysis of one of the two human skeletons found at Coppergate. Her skeleton was found in a shallow pit close to the River Foss. Her legs were missing due to later ground works. It is possible that she was buried towards the edges of a group or in a cemetery that lay outside the Coppergate excavations although, as no other burials have been found here, she may have been an outcast. Analysis has told us that she was robustly built but had widespread degenerative joint disease, and was 5 ft 2in (c.1.59m) tall. Isotopic analysis of lead, strontium and oxygen levels in bones and teeth can show broadly where an individual grew up and what sort of diet they had. 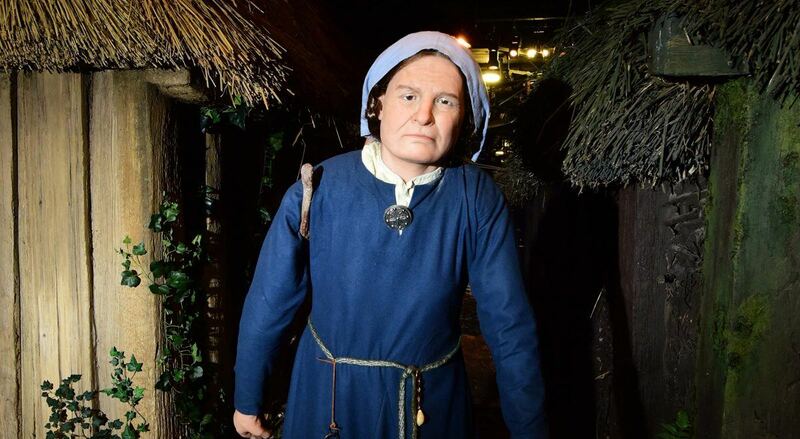 This woman did not originate from Jorvik. She spent her childhood by the coast, probably in South-west Norway or the northern tip of Scotland. She has a range of defects in her hips, legs, spine, ribs, shoulders, knee, hand and wrist; painting a picture of a smallish, middle-aged woman with a pronounced limp and reliant on a crutch due to a genetic problem with her right hip. Within one of our houses is a priest administering last rights to a dying woman, whilst her grieving husband looks on. The first Vikings who came to Britain were not Christians and worshiped their pagan Norse gods, but they seemed to have adopted Christianity quite quickly. There is lots of evidence for there being a Viking-era church just behind Coppergate and there were many other new churches built in Jorvik at this time. The Priest wears a simple alb, superhumeral and woven belt. He has a maniple with a cross embroidered onto it over his arm and a stole around his neck, which marks his priestly status. A very small pink coloured silk reliquary pouch, which is hanging from his belt, is based on a find discovered in the remains of one of the buildings. The embroidered cross on it suggests that it once held holy relics which have since disappeared and are now a mystery. In our final house is a storyteller who is recounting the Völuspá, which is the first and best known poem of the Poetic Edda. It tells the story of the creation of the world and its coming end at Ragnorok. Told in Old Norse, our storyteller conjures up images of serpents, whirling stars and wolves which emerge from his hearth whilst evocative music, played on harp and pan pipes, can be heard in the background. Scandinavia and Iceland have traditions that are rich in saga telling, music and poetry. 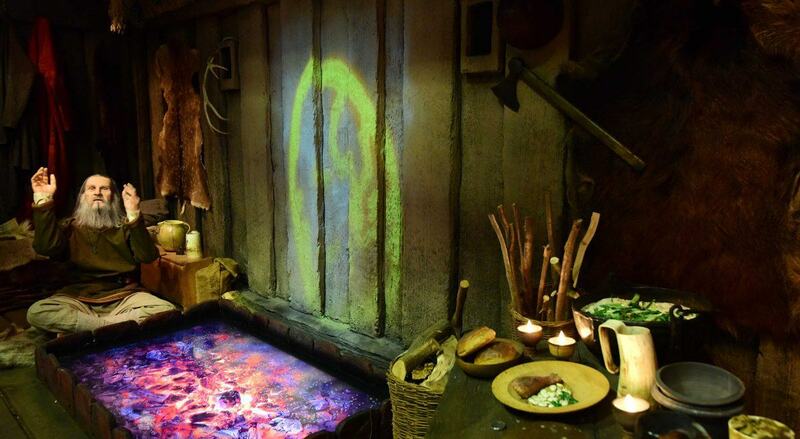 Clues from Coppergate reveal how the Vikings living here may have spent their spare time entertaining themselves, including a few musical instruments, board game pieces and ice skates. A syrinx, or panpipes, made of boxwood was found in a 10th-century pit. This is the only example of such an instrument known from the Viking period. It still produces a five-note scale, running from top A to top E; it is thought that there may have been more tubes originally, perhaps seven.